Journeys… At all times attractive they are! How many great masterpieces of literature and art were created under the impression of meeting with something brand new and unexplored. 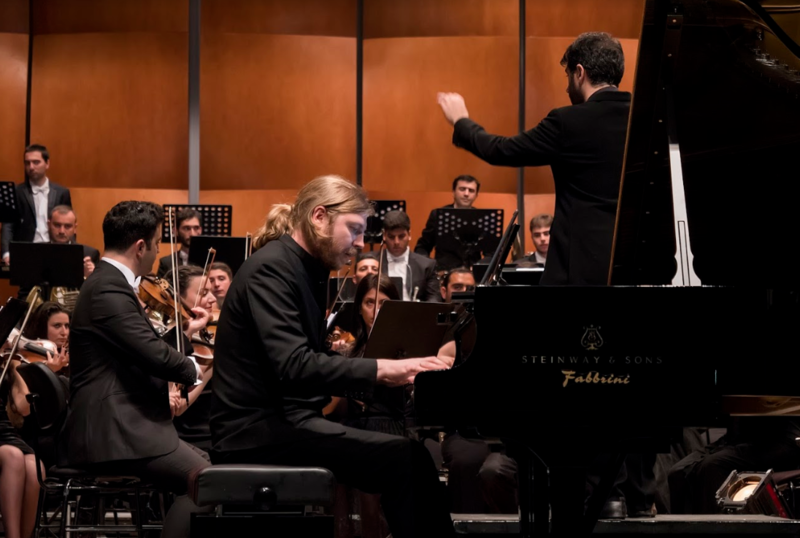 In the midst of the Festival, the Armenian State Symphony Orchestra and Sergey Smbatyan had a “sea voyage” to the fabulous “musical extravaganza” of Rimsky-Korsakov, and then, together with the pianist Denis Kozhukhin, they had the most journey across Europe with Travel Notebook by Alexey Shor. The legendary Sindbad the Sailor, whose voyages are described in the “Thousand and one nights”, inspired another traveller, composer Nikolai Rimsky-Korsakov, to create the symphonic Suite “Scheherazade”. During his three-year round-the-world voyage on the clipper “Almaz”, he described his acquaintance with the water element in a surprisingly bright literary work – “Chronicles of my musical life”. 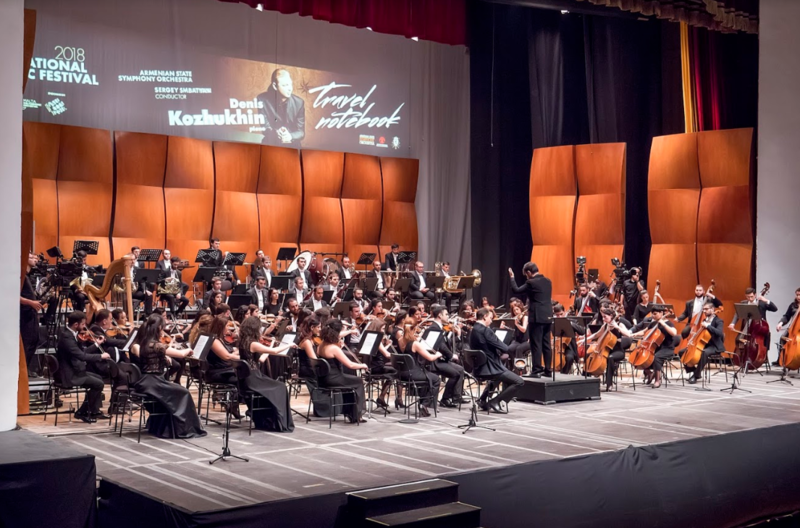 Rimsky-Korsakov, an unsurpassed master of musical painting, demonstrated in Scheherazade the exceptional possibilities of orchestral colors and the feast of “sultry” harmonies. Eastern exoticism, in fashion throughout the nineteenth century became a favorite theme of the Russian composers. The “Scheherazade” perceived sensitively by Armenian musicians was a real visual and sound performance! And the musicians, and the audience was enthralled by the drama of the narrative. Sergey Smbatyan worked without score and showed off all possible sound colors of the orchestra, all its power and strength! 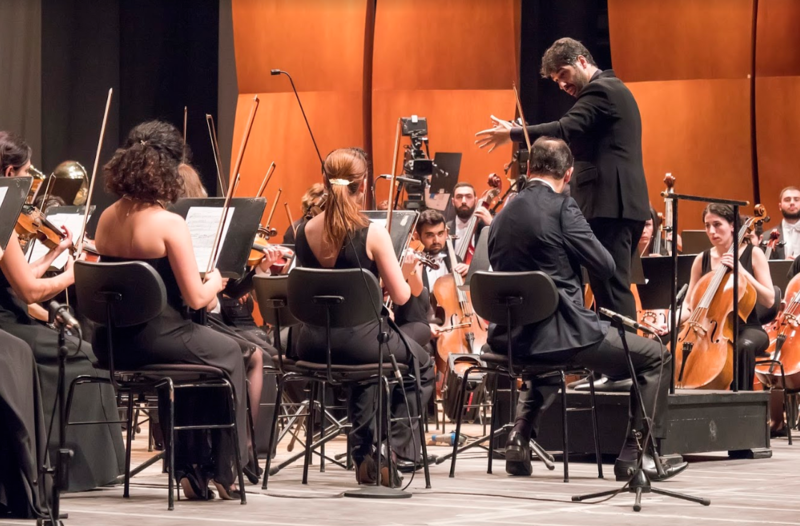 The young conductor managed to pass on the composer’s message so the audience could make “an impression about this, definitely, Oriental narrative, its numerous and diverse fairy-tale miracles”!.. Talented Russian pianist Denis Kozhukhin, the 1st prize winner of the prestigious competition named after Queen Elizabeth, who is known for brilliant interpretations of Schubert and Prokofiev, was presenting Alexey Shor’s Travel Notebook and said that he believes that this cycle is “something of interest, because the composer, by giving titles to his pieces, takes a certain responsibility by showing to the interpreter and audience a very specific image”! Going for a fascinating journey offered by Alexey Shor, please note a coherent architectonic works — seven-fold contrast composite form.